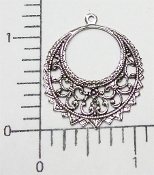 This is a round filigree dangle with a ring, matte silver ox, sold by the dozen. Made in the USA! The piece is approximately 1-1/8" x 1-1/8".